Americans! Where's the Outrage Regarding Your Financial Situation? Why aren’t Americans saying: “I’m mad as hell and I won’t take it any more!”? To make ends meet many American families are going into even more debt and more American families than ever are turning to government assistance. [In fact,] right now, more Americans than at any other point since World War II are flat broke and have lost hope. Until this changes, the frustration level in this country is going to continue to grow. Where in the world did all of the good jobs go? Well, the truth is that millions of them have been shipped overseas. Our politicians promised us that merging our economy with the economies of other nations where it is legal to pay slave labor wages to workers would not create more unemployment inside America. They were dead wrong – the job losses continue to get worse – and as the U.S. economy has started to slow down again we are starting to see another huge wave of layoffs all over America. It is not just the globalization of the economy that is destroying our jobs. The federal government bureaucracy has become so oppressive that hiring workers has become so complicated and so expensive that many small business owners want to avoid it at all cost. [Frankly,] it is amazing that anyone is still willing to hire workers in this day and age…[Indeed,] if you are a blue collar worker, you should give up hope that things are going to get better. The system has failed you – and you can stop waiting for the “good jobs” to come back. They aren’t coming back. As our economic system continues to degenerate, Americans are going to become increasingly desperate and, sadly, desperate people do desperate things. Already we are beginning to see signs that the fabric of American society is starting to be ripped to shreds. This country is a complete and total mess. Tens of millions of American families are flat broke and are about to slip into poverty. Meanwhile, our politicians continue to prove that they are some of the most corrupt on the planet. 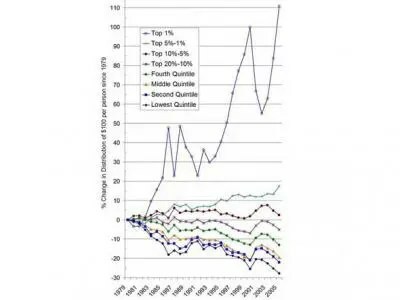 This chart shows average income of the top 1% as a multiple of average income of the bottom 90% (via The Nation). 3. Half of America owns only 0.5% of America’s stocks and bonds. The top 1% owns more than 50%! 4. 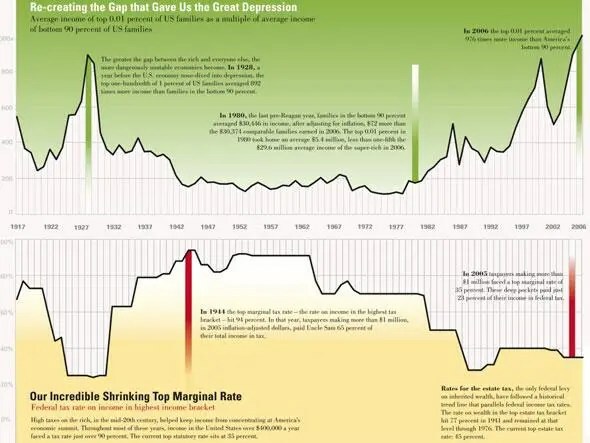 The wealth gap has spread dramatically in the past 20 years! 5. The disparity in pay of the average CEO and both that of the average production worker and the Federal minimum wage has expoded over the past two decades. 6. Real average earnings have not increased in 50 years – that’s HALF A CENTURY! 7. Savings rates have declined since 1982 as Americans borrow money to keep up although they’re rising now. 8. Poor Americans have a SLIM CHANCE of rising to the upper middle class despite the myth of social mobility. 9. 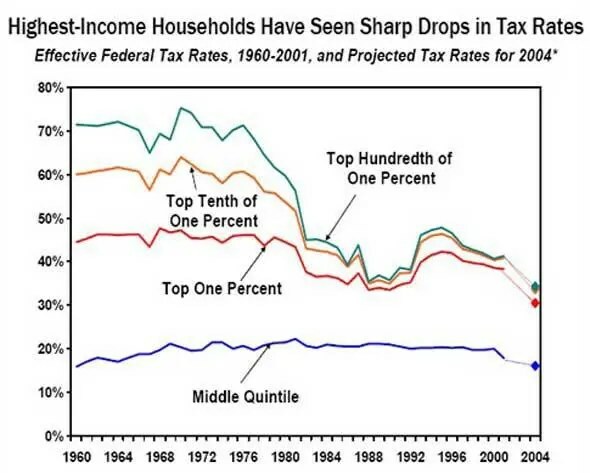 The wealth gap has been significantly increased by Republican tax cuts. 10. 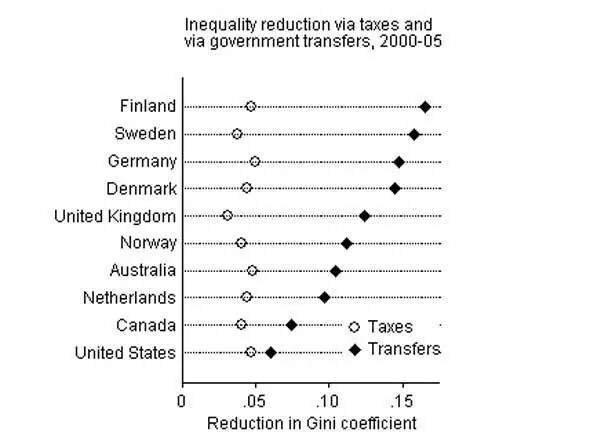 Income taxes keeps getting lower and lower for the rich. 12. 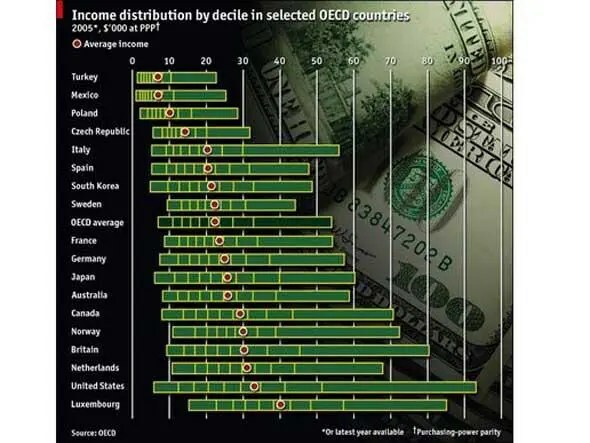 America’s income spread is nearly twice the OECD average. 14. Income inequality is worst in the South, South West, South East and North East. [As mentioned previously,] most Americans don’t understand what is happening because neither the mainstream media nor our politicians are telling them the truth. We are being told that we just need to accept a lower standard of living and most Americans seem willing to accept that reality because they keep sending most of the exact same bozos back to Washington D.C…. Previous Are We On the Verge of a Second Recession? Next What Would U.S. Default Mean for Canada – and the Global Economy? 2.When will he/she get the courage to tell his/her political representative is Washington and in his/her state capital that “I am mad as hell at being taken advantage of and can not – and will not – take it any more!”? 4.When will he/she go so far as to convey the consequences of political inaction or self-serving action by saying via every means available, “If my next representative fails to do what he/she was elected to do then social unrest will naturally follow. Our country was founded on the refusal to accept injustice and oppression in its many forms. We rebelled once in our history and we will do it again – if necessary!”?